Choosing the best cordless reciprocating saw from a variety of products is not as easy as it sounds. You need to know the cordless system, facilities of cordless and how to compare between products. Cordless tools are one of the greatest tools to have come to the trade because of their eases of use. Cordless system boosted up the work speed for the industrialized nation. And Black and Decker is the company who invented cordless power tools in 1961. In that process, Cordless Reciprocating saw was included in cordless power technology. The cordless design allows free motion and movement when using the product. Cordless tools reduced the amount of time that craftsman would have had to spend on a job because they can just grab to the power tool and screw or cut within a few seconds. With the reduced about of time on jobs means that the builder can move onto the next job and might be able to do more work in a year than before. Many of us may think that the best cordless reciprocating saw, the higher the battery voltage, the more powerful the saw. But this is not all about. You have to consider other feature as well. Let’s take a look at the top 5 best cordless reciprocating saw. We’ve listed top 5 cordless Reciprocating Saw from the best cordless reciprocating saw. Check out the size, weight and other features of the saw before you buy. Making sure will allow you to work safely in confined areas. American inventor Raymond DeWalt, inaugurated the world’s first radial arm saw & a sliding circular saw in 1923 both had the ability to make long cuts with accuracy. 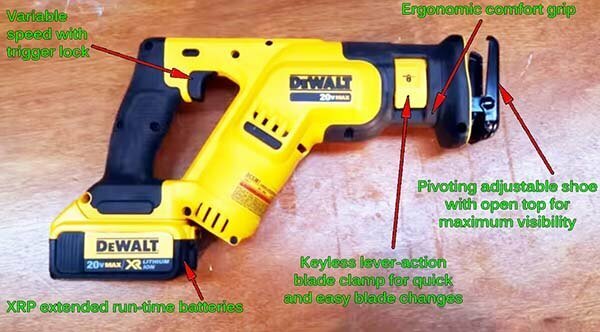 At the cutting edge of portable power tool technology, DeWalt‘s power tools are revered by carpenters and homeowners alike for their long-life, durable cordless battery-styled Reciprocating Saw, other power tools. 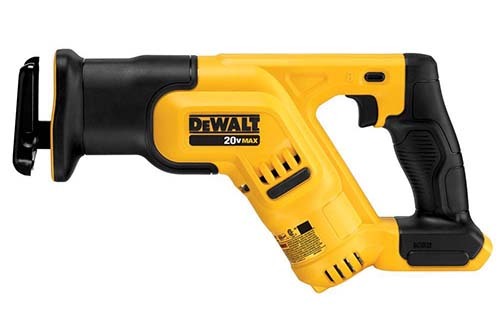 The newest Dewalt DCS387 20V Max tool is a compact cordless reciprocating saw. It resembles the DWE357 compact corded saw that came out nearly three years ago. The DeWalt DCS387 20V Max Compact Reciprocating Saw is one of the best cordless reciprocating saw and one of the lightest on the market, weighing in at 5.0 pounds. It’s also the shortest in the 18/20 volt class with a length of 14-1/2 inches. It features an ergonomic soft grip handle which makes picking up the saw easier. It will boost your efforts and you will end up completing your work within the shortest time possible. Its capability to fit between studs provides the best solution for professionals who need a saw for tight situations. Founded in 1915 in Japan, the Makita Corporation has also staked its reputation on cordless, battery-powered power tools. About 1987, the company had a full arsenal of cordless, professional-grade power tools for contractors. The Makita XRJ02Z LXT Lithium-Ion Cordless Reciprocating Saw is ideal for almost all jobs. It is very powerful and versatile making it an ideal choice for all cutting jobs. And this also makes it one of the best cordless reciprocating saw. This is a powerful cutting and demolition saw that can be used in worksites to deliver excellent results. The Makita XRJ02Z LXT comes with an inbuilt high torque motor with a 1-1/8 in. stroke. The 1-1/8-inch stroke motor cuts at 0-2,900 strokes per minute making it one of the fastest saws on the market currently. The saw can cut up to 5-1/8 inches maximum into a pipe while going up to 10 inches for wood when using the 12-inch blade. The saw comes equipped with star protected computer controls that ensure no over-loading takes place. It shows when it’s full and stops over-heating on its own. Two built-in L.E.D. lights illuminate the work area. The inbuilt LED lights are used to make work easier for the users. 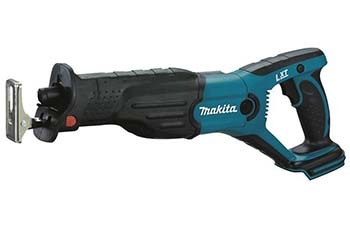 Buy Makita XRJ02Z LXT Lithium Ion Cordless Recipro Saw On Amazon, Now! Milwaukee is a great company. It has historical advances because of Henry ford’s connection with Milwaukee. Milwaukee introduced reciprocating saw in 1951 for the first time. After that Milwaukee’s power tools became a key element in the building of American suburbia. The technology was introduced with the launch of Milwaukee’s revolutionary V28 LITHIUM-ION battery technology and line of cordless tools in 2005. 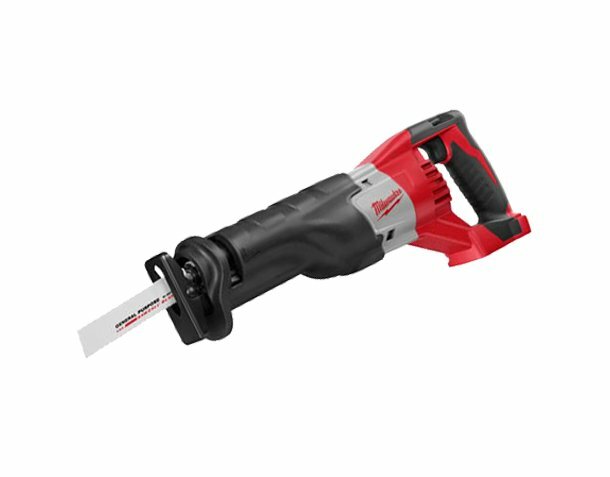 Milwaukee 2620-20 18-Volt 2.8Ah cordless Sawzall reciprocating saw is one of their best product and one of the best cordless reciprocating saw. The Milwaukee 2620-20 Sawzall is suitable because that has a once inch stroke length and a 0 to 3,200 stroke per minute. The speed measured in strokes per minute is controlled by the trigger with a variable speed using the trigger. The Milwaukee 2620-20 Sawzall has Anti-vibration system. And thanks to its patented gear protecting clutch system, the shocks, and vibrations that come when the sawing course or rough items are minimal. The experience is taken a notch higher courtesy of the soft and smooth grip handle. Its well made. Milwaukee 2620-20 is easy to use and very easy to change the blades out with a quick change blade clamp. Milwaukee calls it Quik-Lok blade clamp system. Thanks to the QUIK-LOK clamping design. Milwaukee has also incorporated a more durable battery that charges in lesser time. In fact, the tool delivers 30% more power than tools in the same category. Adjustable speed option allows a user select the right speed at the touch of the button. 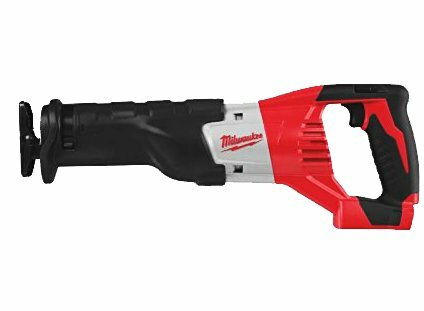 Buy Milwaukee 2620-20 M18 18-Volt Sawzall Cordless Reciprocating Saw On Amazon, Now! Porter-Cable is a high-quality power tool manufacturing company that has been in business since 1906 originally located in Syracuse, New York. Power tool adorer might argue that Porter-Cable’s quality has suffered since Black and Decker purchased the Company in 2005. In reality, it is not. Its product is still in good quality. Look at PORTER CABLE PCC670B 20-volt MAX Lithium Bare Reciprocating Tiger saw to get the proof. This is a very versatile saw on the market. It is also a great tool to use in tight spaces. You do not need to have special tools to change the blade or when adjusting the shoe. This PCC670B model features a very powerful motor that has a variable speed trigger control from 0 t0 3000 strokes per minute. The motor housing of this porter cable pcc670b saw is made of metal and comes with a contoured handle that provides good control of this tool. The metal housing protects the motor from being damaged by particles that come from the blade as well as protecting it from dust. This porter cable pcc670b reciprocating saw comes with a 20V lithium battery that provides a longer run time. The battery has a lower self-discharge than a normal battery, thus enabling you to get a constant power supply. Buy PORTER CABLE PCC670B 20-volt MAX Lithium Bare Reciprocating Tigersaw On Amazon, Now! The Bosch company was the vanguard of power tool technology. It was founded in 1886 Germany by Robert Bosch. Though the company initially focused on automobile components with integrated electric parts, later it was responsible for suchlike developments as the first low-voltage magneto ignition. Bosch introduced its first power drill in 1932. Today, Bosch still engineers and manufactures power tool and is still holding one of the best positions in the market. 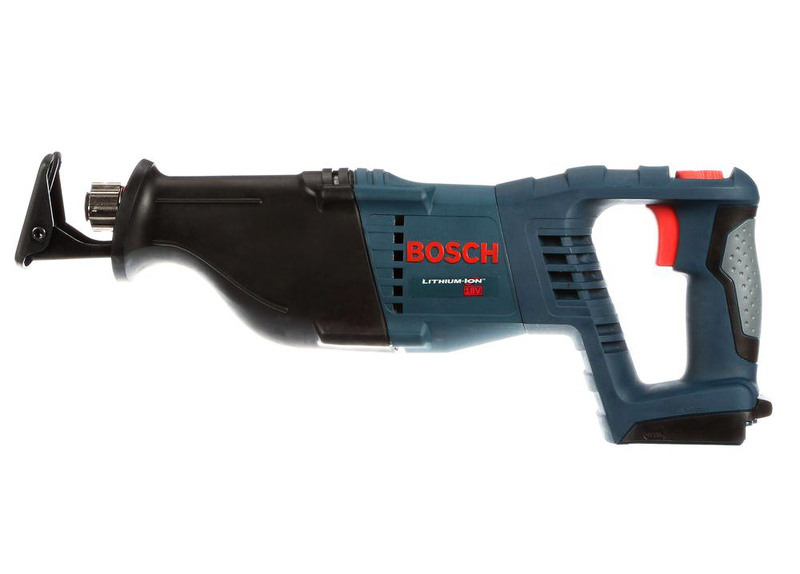 Bosch CRS180BL Bare-Tool 18-Volt Lithium-Ion Reciprocating Saw is an example of this. Bosch CRS180BL Reciprocating Saw comes in a compact size that makes it ideal to use in projects that have a limited space. This tool is handy if you want to cut where a full-length reciprocating saw cannot reach. You can use this saw cutting a leaking pipe that is maybe in your cabinet or even pruning your shrubs outside your house. This product comes with a 2-speed feature. This feature allows you to vary the speed of the saw into two maximum cutting speeds to help you in cutting a different variety of materials. Its stroke length 1.125 in with 2700 SPM can cut light materials easily. Our comprehensive research based on its features forced us to include this into the camp of the best cordless reciprocating saw. Buy Bosch CRS180BL Bare-Tool 18-Volt Lithium-Ion Reciprocating Saw On Amazon, Now!